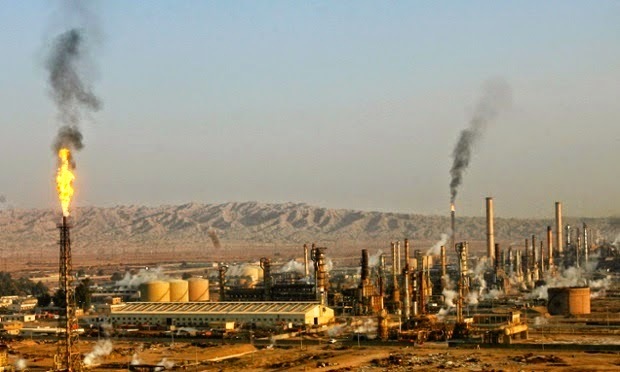 Islamic State insurgents have taken control of half Iraq’s largest oil refinery in Baiji, and have cut supply line to the government troops who are holding out inside the sprawling facility. Last November, Iraqi Security Forces broke a month-long siege of the refinery by ISIL fighters. But they returned and are now on the verge of capturing the refinery. The push by ISIL is an indication of the precarious security situation in Iraq and the fact that the security forces are spread too thin. The refinery has been shut down for a while, but the loss of the facility would be a blow to the government and a huge success for ISIL. Meanwhile, ISIL took responsibility for late-night car bomb attacks late Saturday in the Karrada district, in the heart of Baghdad, killing at least 19 people. Police said the dead and wounded were mainly shoppers and people commemorating the death of Imam Ali, the key figure in Shia Islam. There has been a major spike in car bombs in Baghdad over the past week, leading to speculations that the insurgents have infiltrated the capital by hiding among thousands of the displaced persons fleeing the fighting in Ramadi. Can't get my head around these dramatic swings in Iraq. How is it that the shia of Iraq, with no real logistical problems compared to Iran's allies in Syria and with a hundred thousand IRGC troops presumably at their backs, can the Iraqi government aligned forces be out maneuvered time and again. Is the Chenchen truly a genious? Or are we just waiting for a deal to be done so as to get to the end game where we finally know who's fighting who in these war's and for what goals. If we could get a 5 minute ceasefire the Americans could declare mission accomplished and piss off and stop confusing things. I understand I cannot put an Umbrella over all Shia in the region. But surely not, is it tensions between Arabic speaking Iraqi shia and Farsi speaking 'advisors' that leads to the loss of such an asset as this refinery? Or has this been allowed to happen to embarrass the Yanks? Baghdad government? @interested party. Basically the IRGC and their ilk are very good at shooting at unarmed protesters and torturing political prisoners. Don't expect them to fight on an equal footing.